TOKYO--(BUSINESS WIRE)--Toshiba Electronic Devices & Storage Corporation (“Toshiba”) has today started to supply “TMPM3HQFDFG” microcontroller for use in general-purpose MCU boards manufactured by Thundersoft, a Chinese platform technology provider that designs, manufactures and develops circuits and platforms for devices, including smart devices. TMPM3HQFDFG is an Arm® Cortex®-M core-based microcontroller in the TXZ™ family’s “M3H group” developed for consumer and industrial equipment. In recent years, methods for rapid system prototyping have advanced by combining microcontroller boards with commercially available function boards. Thundersoft’s general-purpose MCU board integrating TXZ™ family microcontrollers is compatible with the Arm Mbed™ OS. Customers can start development immediately after the introduction of the MCU board, using an on-line compiler and other development environments provided free of charge by Arm. 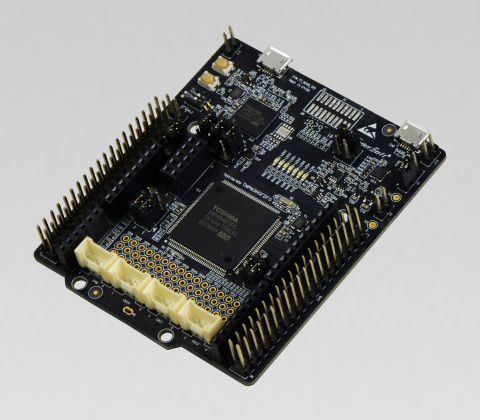 The board is also equipped with Arduino compatible connectors and SeeedGrove connectors, both widely used in the industry, and it allows rapid system development— prototyping—with numerous commercially available shields (function boards) and sensors. Thundersoft’s general-purpose MCU boards will be available on the Taobao website in China and on the Thundersoft’s corporate website in other regions from this month. Toshiba will support a wide range of customers in speeding up time to market for products and expand its semiconductor business by reflecting the needs of customers to its product development. Incorporates the global standard, Arm Cortex-M core-based microcontroller TMPM3HQFDFG equipped with a wide range of peripheral circuits to enhance versatility. Mbed support enables use of Arm’s development environments. For details of TMPM3HQFDFG, please visit the following website. For details of Thundersoft’s MCU boards, please visit the following website. For details of Mbed, please visit the following Mbed website of Arm Ltd.
* Arm, Cortex and Mbed are registered trademarks or trademarks of Arm Limited (or its subsidiaries) in the US and/or elsewhere. Toshiba started to supply Arm Cortex-M core-based microcontrollers for use in general-purpose MCU boards made by Thundersoft.